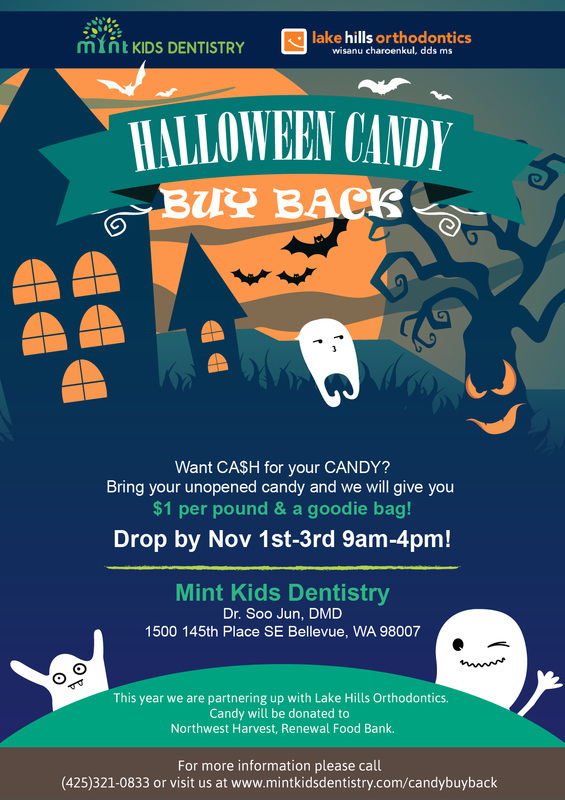 Mint Kids Dentistry Candy Buy Back is BACK! Don't deny your child the Halloween experience. Instead, let them have the joy of Halloween in all its ghoulish goodness and the experience of going to a party or trick-or-treating. However, after your children get back from the party or trick-or-treating, go through their bags of Halloween candy together. Tell them to pick the 10 or so (whatever number you decide together) treats they want most. Then get the unpicked treats out of sight. ​Toothbrushes should be replaced every 3 to 4 months anyway, so make Halloween an occasion for getting your child a new toothbrush. Children are more apt to brush when they like their toothbrush. Children also like to pick out their own toothpaste. Give them the freedom to pick from gels or pastes, different colors and different flavors. Just check the label to be sure it contains fluoride. There are also apps such as "toothsavers" that encourage teeth brushing as well as video games to play involving brushing the "bugs" away. Check out 2min2x.org as well as mychildrensteeth.org for additional ideas for more "fun" dental information.